The annual 100 Words Film Festival challenges talented filmmakers from around the world to deliver compelling tales using exactly 100 words. 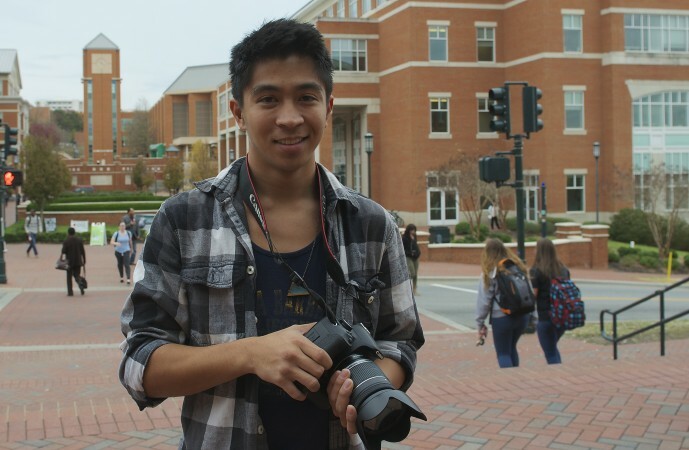 The strict parameters are not easy to work with, but UNC Charlotte student and filmmaker Mark Borja took on the challenge, with two films chosen for screening at the November 2014 festival. Borja’s first film in the festival, Read All About It, took on the task of working with a non-profit to showcase a cause. He and his teammates developed a music video sponsored by and shot at the North Carolina Sports Hall of Fame. The film included Lego stop motion video and sports figures such as Phil Ford and John Swofford, with the goal of encouraging children to read. The team’s second film, Once More Around the Sun, explored personal struggles and relationships. While the film did not win in the student category, the experience provided Borja a powerful opportunity to grow and to share with others. As a pre-communication studies major and film studies minor, Borja has been a passionate filmmaker since age 13. He has previously participated in the 48 hour festival and heard about this festival from Rodney Stringfellow, adjunct screenwriting faculty member. During the 100 Words Film Festival at the McGlohon Theatre in uptown Charlotte, Borja interacted with participants ranging from Academy Award nominated directors to talented student filmmakers. Borja has formed a production company with friends, called The Scary Kind. He is focused on learning how to operate and brand a company to build an online magazine showcasing arts and culture.